Today Miss Martindale showed us a clip about making a 3D snowflake.At first we thought it would be hard but it was quite easy once we got the hang of it. You need a pair of scissors, selotape, plain paper, stapelor and you especially need patience! You need six pieces of square white pveraper too. We were so pleased with our 3D snowflakes and it was VERY FUN!! This week we have been reading and writing winter poetry. We started out by reading a selection of different poems and discussing and analysing the language features. In particular we have been looking for examples of similes, metaphors and personification. Children have chosen their favourite poems. You can hear a selection of children reading their favourite poems below. We are currently in the middle of writing our own winter imagery poems. Look out for them soon! Here some members of the class explain a little about camera shots and movement. Did they miss any out? Can you remember any more? This term in Get Publishing University we have been writing and typing storys on a web site named story bird. Why don’t you make your own on http://storybird.com . We all enjoyed it mostly because of the amazing illustrations that we got to choose from. The website was very easy to understand and work on. Click on the link to see other amazing storys including ours and many more! This week in numeracy we have been learning all about 3d shapes and their properties. On Monday we started with 2d shapes. We were sorting the shapes into Venn and Carroll diagrams. Some of us chose to work with Miss sorting the shapes into hoops and others chose to work independently and choose their own ways to sort. Yesterday we had to describe the properties of 3d shape. Some of chose to use blu tack to cound the faces, edges and vertices on diferent shapes. Others chose to solve a puzzle where you had to match the description to the correct shape. Others decided to make their own puzzle up for a partner. Today in numeracy we have had a fantastic time! We have been visualising 3D shapes.Aso we picked a card with a shape name and made 3D models from straws and modelling clay to show we could visualise different shapes in our minds. Everybody had brilliant fun! We had to use great team work today too. Tomorrow we are going to make christmas decorations that are different 3d shapes when we work in santa’s workshop! Year 4 drumming performance. A small snippet. Here is a tiny snippet from our wonderful drumming performance. Unfortunately I cannot upload the other videos as I do not have permission for all of the children who appear in the videos to be on the blog. Well done to everybody in Year 4 for your excellent progress in drumming. You truly are a real band! 4G have been busy recording their films. I have been extremely impressed how they have all learned their lines. Well done everybody who have already filmed. Here are a few snippets to give you a taster. We still need to edit and link the clips together. Hope you enjoy what we have been doing so far. Please add your comments to the voice thread below. If you have a microphone (a laptop should have an inbuilt microphone) you can add voice comments. If not you can type your comments. I was hoping you could think of some descriptive words and phrases and examples of personification, similes, and metaphors to add to the different images. There are four different images that you can comment on. To move between the different pictures just click on the picture you want to view on the bottom right hand corner. Press play to read or hear the comments that have already been made. You just need to click on ‘add comment’ below and then you can choose whether to record a comment or type a comment. Enjoy! I have added a couple of comments to the pictures already. Please help me by adding your comments too! Please rehearse your songs for the christmas concert over the weekend. Literacy: We will be reading an creating our own winter imagery poetry. Please revise what the terms simile, metaphor and personification mean. Do a search online and find some poems about winter and snow. If you have any books with winter poems then please bring these to share at school. You could of course type a poem up as a comment on this post. Use the pictures below to write some snow similes. Numeracy: We will be learning about 2d and 3d shapes this week. 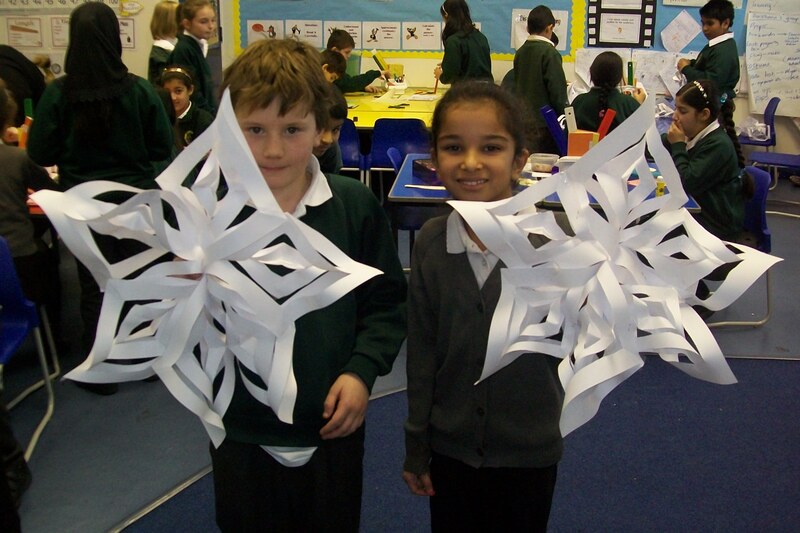 Later in the week you will be using your knowledge of nets and 3d shapes to make some christmas decorations. Topic: Time to finish filming and edit the films! Pleasethink of a design over the weekend for the cover of your dvd. Today we have turned our classroom and the art room into a film studio! Some children started the day by getting into costume and filming the scenes that need the green screen. Others have been getting on with fascinating activities that link to our films such as analysing the data from our film surveys and designing the posters that will advertise our films. .After lunch we all came together as a class and we filmed some of the scenes for our films that don’t need the green screen. It was peculiar filming today because we found that when you make a film you do not have to film the scenes in order! Some of the films recorded their ending first and jumped around all over the place! When we edit the films we will put them back in to the correct order and add the special effects. We also discovered what the term ‘corpsing’ means! Some actors and acteresses couldn’t stop laughing!. Below you can see some photos from throughout the day. Can you spot the camera when filming is taking place? At the moment you can see the green screen but when we edit you won’t. We also learned about camera movements. We now know different types of movement that the camera operator can use. For example, you can pan left or right, or tilt up or down. We will make a video and upload it to the blog to teach you all about camera movements soon. Throughout the day we have had brilliant fun but we had to be extremely patient whilst waiting for our scenes. We didn’t realise that extras had to be so quiet and mime so much of their action!